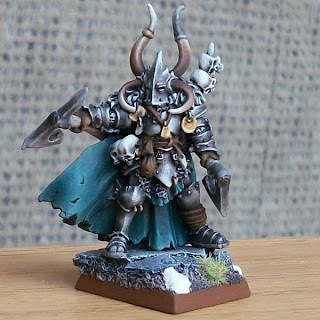 Continuing with the Chaos Mortals theme of my last post, I present the Games Day 2009 Chaos Lord on foot model. When I saw this model, I knew I had to paint one up. He's such an awesome sculpt. For some reason the funny shaped helmet appeals to me, as does the challenge in his pose. If you read my last blog entry about failed color schemes, you'll note that I got it right with this model. This was exactly what I was looking for. I used darker tones of blue and green to make the mix, I added much more green than blue to the mix, and I didn't highlight the green-blue mix up nearly as much as I usually would for a Warhammer model. I mixed up the browns a bit. 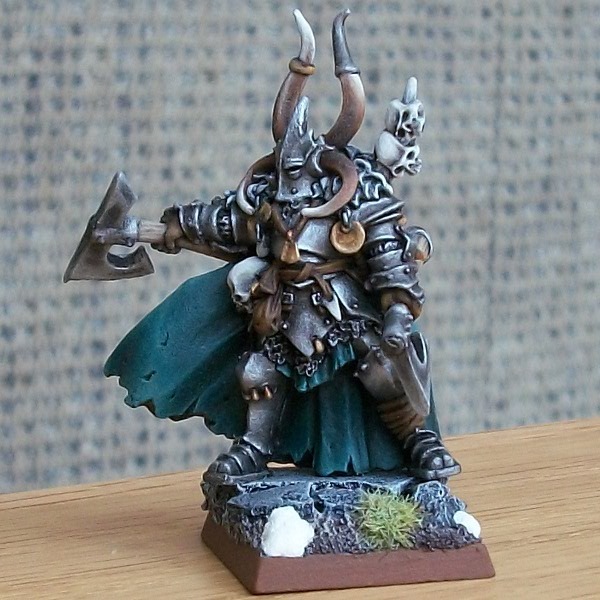 These are a bit darker than the ones on the Chaos Warrior. I also added some yellow to the final highlights of some of the browns; in order to complement the armor recesses, and contrast a bit with the somber greens of the cloak. 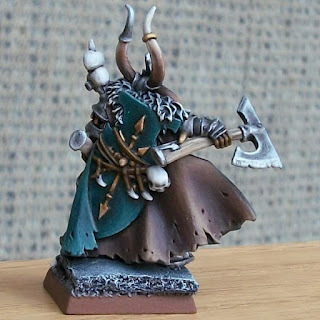 Were I to paint an entire Chaos Warriors army, I would mix up the browns and use several tones across the entire force. When doing the armor glazes, I at one point had too much green in the mix. It gave the model an interesting monochrome look, but all the nice detail was lost between the cloak and the armor. It all just blended together way too well. Sometimes you'll have what seems like a good idea, until you put it into practice. Still, it was a nice lesson. If I had been using a different main color other than green-blue, it could have looked really good. The armor paint scheme is as follows: It gets base coated with Boltgun Metal. Then I apply a brown wash with a bit of orange mixed in. 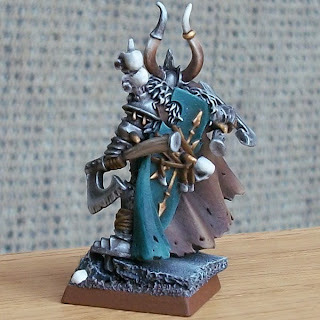 From there, I do a heavily watered down layering technique, using first Boltgun Metal, then Chainmail, and lastly Mithril Silver. I paint them the same way that I would paint any normal non-metal pigment paint. If at any point the layering looks too stark, I apply a layer or two of glaze (heavily watered down paint, usually Bestial Brown, Scorched Brown, maybe Fiery Orange, or Devlan Mud). Then I re-highlight with the exact same color to even out the model before continuing to the next lighter highlight layer. Just the very tips and edges get hit with the Mithril Silver. I worked in a few gold/bronze bitz across the model, just to break up all the silver based metal. The base is similar to that of the Chaos Warrior that I previously posted. Again, blog posts on making those are forth coming. Awesome paint work. Good to see it done in something other than the typical GW circus candy colors of the four.